Cook 300g essential Waitrose Easy Cook Long Grain Rice in boiling water for 10-12 minutes, drain. Meanwhile, blanch 1 essential Waitrose Cauliflower, cut into florets, and 350g essential Waitrose Broccoli, cut into florets, for 5 minutes, drain. Heat the 1 tbsp oil in a large frying pan and fry 1 essential Waitrose Onion, sliced, for 3-4 minutes, until softened. Add 1 tbsp medium Madras curry powder and cook for 1 minute. Stir in the blanched vegetables with 50g toasted flaked almonds and 100ml water. Fry for 3-4 minutes. 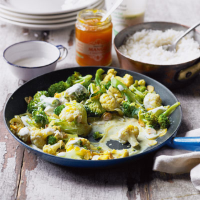 Remove from the heat and stir in 150g essential Waitrose Fat Free Natural Yogurt and 2 tbsp mango chutney. Serve with the rice.